The Small Business Administration (SBA) has instituted a waiting list for its flagship 7(a) loans because the program hit its annual lending cap of $18.75 billion on Thursday (July 23, 2015). SBA officials, lenders and small business groups are urging Congress to raise the program’s authorization to $23.5 billion in order to free up loans for small businesses. Demand for the program is high because the government-guaranteed loans are the primary source of long-term loans, which feature lower monthly payments, for small businesses. The House overwhelmingly approved a measure Tuesday (3/27/2012) designed to make it easier for growing companies to attract investors and comply with securities laws. The bipartisan measure, strongly backed by both parties and the White House, passed 380 to 41. The Jumpstart Our Business Startups Act, or JOBS Act, first passed the House earlier this month with wide bipartisan margins and the Senate approved it last week after adding amendments that provide additional safeguards on “crowdfunding” to prevent credit scams. The House needed to approve the changes before sending it to the White House for President Obama’s signature. The legislation lifts Securities and Exchange Commission restrictions on running advertisements soliciting new investors and permits “crowdfunding” so that entrepreneurs can raise equity capital from larger pools of small investors. Small private companies also would be able to sell up to $50 million in shares as part of a public offering before having to register with the SEC, and could have as many as 1,000 shareholders, up from the current cap of 500. But critics say that the changes would allow firms to avoid disclosing crucial financial information and elude government oversight, opening the door to fraud and investor abuse. Obama’s support for the bill has put him at odds with frequent allies, including labor unions and consumer and regulatory groups. And though the Senate approved the measure, half of the chamber’s Democrats voted against passage. Congressional aides said some Democratic senators felt boxed in by the Obama’s enthusiasm for the measure. As The Post’s Zachary A. Goldfarb reported Tuesday, the White House has worked hard since the fall to reconcile with liberal groups, adopting tougher rhetoric toward Republicans and advancing a series of policy proposals embraced by allies. But when liberals revolted over this recent legislation, the White House responded with what critics complain was only a token acknowledgment of their concerns. Lawmakers are expected to move next to competing proposals that would provide further tax cuts to growing companies — part of a GOP strategy and Democratic counteroffensive to introduce less ambitious, but politically popular economic-themed legislation. Cantor and House Republicans plan to vote next month on a measure that would grant 20 percent tax cuts to growing companies; a Senate Democratic proposal introduced this week would provide $26 billion in tax credits to smaller companies that either hire new workers or increase the overall size of their payroll. — by Ed O’Keefe, The Washington Post, March 27, 2012 at http://www.washingtonpost.com/blogs/2chambers/post/house-passes-jobs-act-sends-bill-to-obama/2012/03/27/gIQA9DfZeS_blog.html. The four largest banks in the U.S. are among 13 financial institutions that have committed to increase their lending by $20 billion to small businesses over the next three years, reports the Washington Business Journal. The banks are: Wells Fargo, Bank of America Corp., Citigroup Inc., JP Morgan Chase & Co., KeyBank, Regions Bank, Huntington Bank, M&T Bank, Citizens Financial Group, TD Bank, US Bank, PNC Bank, and SunTrust Bank, the article said. Karen Mills, who heads the Small Business Administration, made the announcement while touring the Ohio-based Wrap-Tite packaging supply company that was recently given a $1.5 million SBA loan. According to the Associated Press, the loan enabled the company to purchase a production facility five times larger than its old locations and expand its number of employees. On Sept. 20, Vice President Joe Biden also visited the plant to underscore the significance of the 13 bank commitment. The move will buoy small business lending that dwindled from $700 billion in 2008 before the recession to $600 billion, Biden told the AP. Small-business trends will be influenced this year by passage of the Small Business Jobs Act of 2010 (H.R. 5297). According to the SBA, the new law provides approximately $30 billion to small banks (those with less than $10 billion in assets) for lending to small businesses, offers approximately $12 billion in tax breaks to small businesses and expands the loan limitations of the SBA. For women-owned businesses, there may be even more loan opportunities. Banks may be able to offer credit to small businesses that might not have qualified previously. (According to the SBA, in the first week of the Small Business Jobs Act, the agency provided nearly 2,000 loans totaling nearly $1 billion.) State funding programs and community banks also will receive more federal dollars to lend to small businesses. And the law provides $50 million in grants to Small Business Development Centers to fund counseling and training. Increased business lending. Two things will influence this trend: 1) businesses will start asking for credit again and 2) SBA dollar volume is expected to increase. At the annual conference of SBA lenders in Anaheim last fall, executives predicted that the volume of loans will double in 2011. More businesses will be willing to make investments and borrow money, and banks are more willing to lend when they can make use of SBA risk enhancements such as guaranteed loans. Enhanced renewable energy lending programs. In 2011, expect more small businesses to make improvements such as adding energy-saving solar panels to their businesses. Some banks will offer specialized programs to incorporate solar-panel improvements into SBA loans. This applies not just to large businesses but smaller ones as well. They’ll be able to save energy by using solar to heat and power their businesses. Revised refinancing. Now may be the time for small businesses to refinance real estate loans. The new law allows SBA 504 loans to be used for refinancing real estate loans on owner-occupied commercial property. The SBA also has increased the maximum 504 loan amount to $5 million ($5.5 million for manufacturers and energy loans), and waived fees for banks and borrowers. Increased exporting. The new law offers various incentives for small businesses to export goods, including turning a pilot loan program into a permanent program with 90 percent guarantees for loans up to $350,000. Loans between $350,000 and $500,000 receive 75 percent guarantees. Increased certification for government contracts. The new law strengthens small businesses’ ability to compete for federal contracts. Women-owned businesses that are certified can compete for federal and state government contracts. Government agencies award millions of dollars in contracts to small businesses every year. See the SBA website for details. In 1998, the outcome of a legal case changed the course of Barry Bennett’s life. Bennett, who was working for a geotechnical and environmental engineering firm in Atlanta at the time, had provided expert testimony for a family-owned company that was suing a large manufacturer for non-payment. It was at that pivotal moment that the idea started for MME, an Atlanta-based, minority-owned engineering firm that has been providing technical experience in metallurgy, civil engineering, engineering sciences and utility services since 2001. Today the company has two major divisions – materials engineering/metallurgy studies and civil engineering/infrastructure analysis – and employs 70 people across three locations. MME’s customers run the gamut from law firms to municipalities to large manufacturers. Because of the company’s relatively young age and shift in focus, Bennett was intent on taking advantage of any and all opportunities available to his SBA 8(a) certified company, a designation that means the company meets the requirements of being a small business, is unconditionally owned and controlled by one or more socially and economically disadvantaged people who are U.S. citizens, and demonstrates potential for success. Most importantly, having 8(a) certification means a business can bid on government projects not available to uncertified companies. 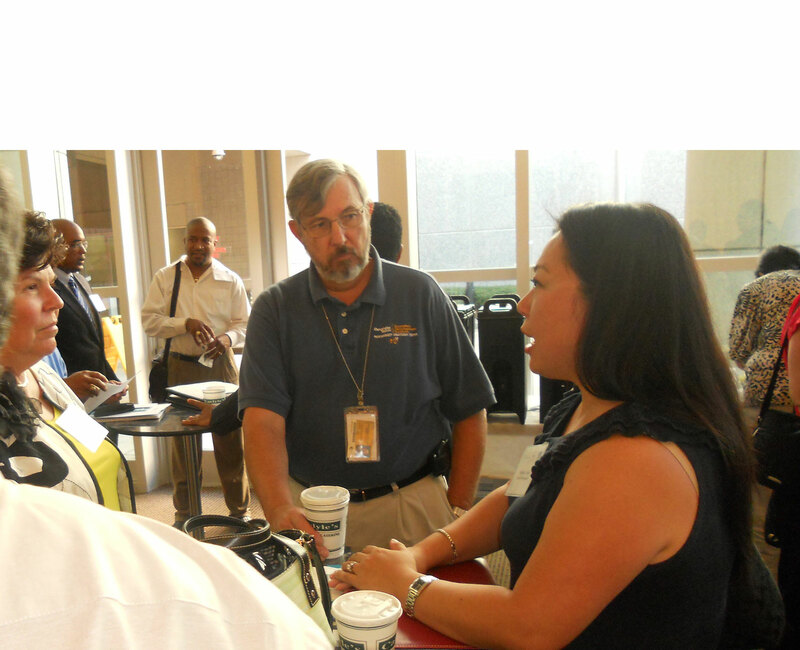 The Georgia Minority Business Enterprise Center (GMBEC) is operated by the Georgia Tech Enterprise Innovation Institute, providing business and technical assistance that helps emerging and existing minority business enterprises (MBEs) experience significant growth and sustainability, and have long-term economic impact through the creation of jobs and revenue. Part of a national network of centers established to increase the number of MBEs and strengthen existing ones, GMBEC provides services in business assessment, access to capital and finance management, access to markets, strategic business consulting and business process improvement. Bennett says that his interactions with GMBEC have proven to be invaluable to his business. Working with Hill, Bennett began to examine MME’s banking issues and re-structured some of the company’s loans for a monthly savings of $30,000. She also encouraged him to purchase the company’s 10,500-square-foot headquarters building in Suwanee – which he had been renting since 2001 – resulting in a more lucrative credit line and a savings of $4,000 a month. Hill also assisted Bennett with his application to the Governor’s Mentor Protégé Connection program, a unique opportunity for a select group of Georgia’s emerging businesses to improve business practices, develop relationships and promote business growth. The program partners a small business with a leading Georgia-based corporation to focus on areas such as new markets and global expansion; professional development, business training and networking; business operations improvements; and cutting-edge business practices and mentoring. In February, MME was partnered with Southern Company for the year-long program. Currently, Bennett is in the process of putting together a master service agreement with Southern Company to provide non-destructive testing and metallurgical services throughout all Southern Company plants. MME will begin with the Georgia and Alabama plants, and then take advantage of other opportunities in Florida and Mississippi as the project progresses, giving them tremendous opportunities to grow. Hill, described by Bennett as someone he “trusts exclusively,” agrees that MME is well-poised for growth and long-term success. GMBEC celebrated its sixth year at Georgia Tech in 2009, and over that time it helped clients secure more than $232 million in procurement contracts, financing, and sales; assisted minority companies with creating more than 3,000 jobs; and provided one-on-one technical assistance to some 450 firms and advice, guidance, and resources to thousands of others. The program received the 2010 Special Recognition Award from the Georgia Hispanic Chamber of Commerce, 2006 Institution Award from the Greater Atlanta Economic Alliance and has been recognized by its federal sponsor as an outstanding performance center since 2005. GMBEC works with existing high-impact firms in manufacturing, construction, warehousing, transportation, technology and professional services. Assistance ranges from identification of funding sources to process and infrastructure improvement to securing new business. To qualify for GMBEC assistance, companies must have 51 percent minority ownership and minimum annual revenues of $500,000. Media Relations Contacts: Nancy Fullbright (912-963-2509); E-mail: (nancy.fullbright@innovate.gatech.edu) or John Toon (404-894-6986); E-mail (john.toon@innovate.gatech.edu). Are you selling products or services to the government? Every year, city, county, state and the federal government buy billions of dollars in goods and services from business of all types. This is not a problem if you have 60 days worth of operating capital in your bank account. But what if you dont? In that case, many business owners will try to get a business loan. Although that may help, business loans are tough to get and take a long time to set up. Also, business loans have set limits. What business owners need, is a product that provides financing solely based on the business opportunity on sales possibilities. This product exists and is called invoice factoring. There are many factoring companies that specialize in factoring government contractors and vendors. Factoring accelerates your government payments, and enables you to get paid in days rather than months. Its a form of financing where the factoring company advances you money against your government receivables. You get to use the funds immediately, while waiting to get paid. Once the government pays, the transaction is settled. If you are reselling products to the government, you should also consider purchase order financing. In this case, the factoring company provides you with financing to pay your suppliers, enabling you to make the sale. Purchase order financing works well with invoice factoring and can also help you grow your company exponentially. U.S. Senator Johnny Isakson has announced that he will host a free statewide Small Business Summit on Tuesday, August 17, 2010. This workshop will be held at Macon State University, Conference Center, 100 College State Drive, Macon, Ga., from 9:30 a.m. until 1:30 p.m.
Advance registration is required, and registration details appear below. The forum is an opportunity for small business people to hear from professionals on best practices, federal and state tax responsibilities, information on contracting with the federal government, using social media to enhance your business, and growing a business through exports. The summit will also feature a panel discussion on credit available to business owners in the current economic climate. Presenting organizations will include the Small Business Development Network as well as over 40 state and federal agencies that work specifically with small businesses. Warner Robins Procurement Counselor Larry Selman will be representing the Georgia Tech Procurement Assistance Center at this event. All persons who are interested in attending must make a reservation online at rsvp@isakson.senate.gov, or by contacting Isakson’s office at (770) 661-0999. All persons who wish to attend must do so by the registration deadline on August 9, 2010. WASHINGTON – President Barack Obama signed legislation on Thursday, Apr. 15, 2010, providing $80 million in additional funding to continue important enhancements in the U.S. Small Business Administration’s two key small business loan programs. The enhancements, first made available under the American Recovery and Reinvestment Act, include a higher guarantee on some SBA-backed loans and small business fee relief. The SBA estimates the $80 million will support about $2.8 billion in small business lending under the 7(a) and 504 programs. “Small businesses across the country have been able to secure critical financing as a result of the Recovery Act loan provisions and the continued interim funding we’ve received for the program,” said SBA Administrator Karen Mills. “The increased guarantees and reduced fees on SBA loans have generated more than $25 billion in new loans to small business owners and brought more than 1,200 lenders back to SBA loan programs. In fact, the first two quarters of the current fiscal year have been our best two opening quarters ever for the 7(a) program, with more than $7 billion in guaranteed loans. These programs have been successful in helping jump-start our economy, which is why we will continue to work with Congress on a longer term extension of the increased guarantee and reduced fees. As part of the Recovery Act enacted on Feb. 17, 2009, SBA received $730 million to help small businesses, including $375 million to increase the SBA guarantee on 7(a) loans to 90 percent and to reduce borrower fees on most 7(a) and 504 loans. The funds for these programs were exhausted on Nov. 23, 2009, and an additional $125 million was provided in December. Those funds were exhausted in late February, 2010, and an additional $60 million was provided subsequently. SBA was authorized for an additional $40 million in late March. Under the new extension SBA may continue to reduce loan fees in its 7(a) and 504 programs and to provide higher guarantee levels on 7(a) loans through May 2010, or until the funds provided under the bill are exhausted. This extension has no effect on the continued availability of financing under other SBA Recovery Act programs, including SBA’s America’s Recovery Capital (ARC) loan program and the agency’s Microloan program. Recovery Act funding still remains available for both of those programs.